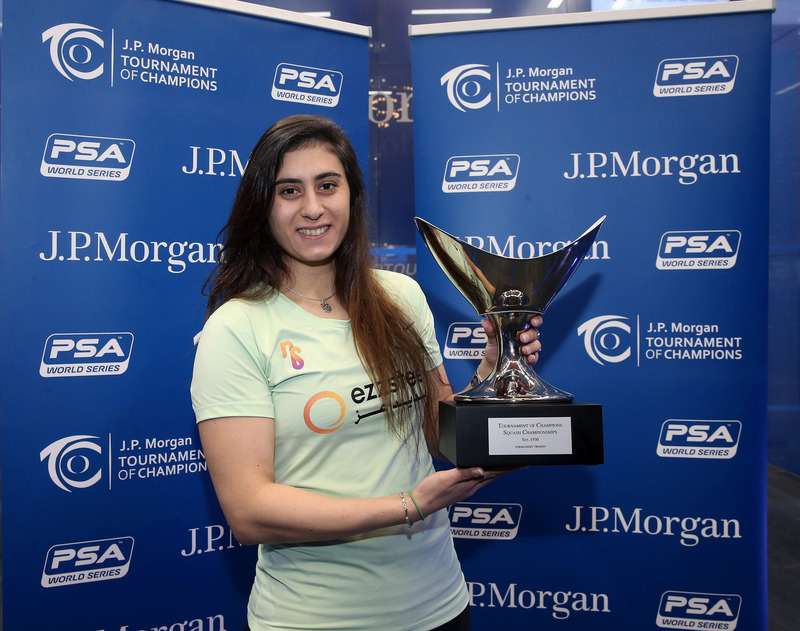 Two-time J.P. Morgan Tournament of Champions winner Nour El Sherbini says that she is looking forward to appearing at one of the most unique locations on the PSA Tour as she begins her title defence later this week at New York’s Grand Central Terminal. 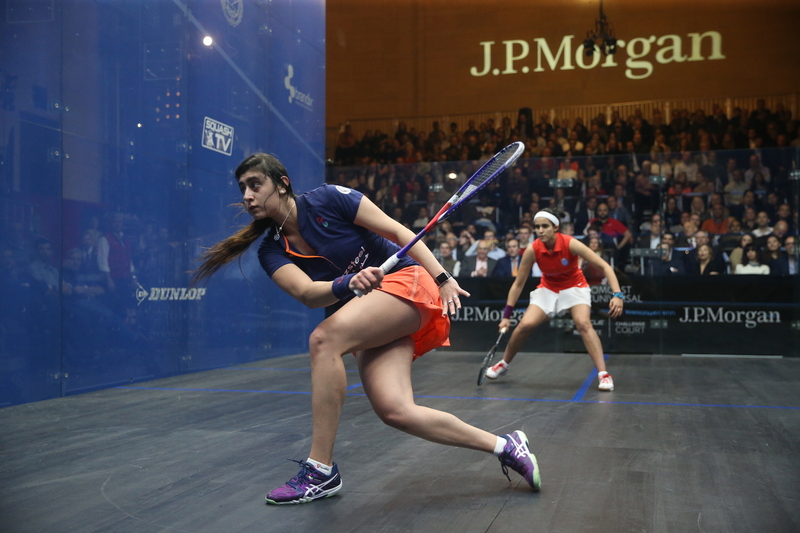 Held under the chandeliers of Grand Central Terminal’s Vanderbilt Hall, the Tournament of Champions is one of the most illustrious tournaments on the PSA Tour and El Sherbini has enjoyed great success in New York, lifting silverware in both 2016 and 2018. No woman has won the coveted title on more than two occasions and the 23-year-old is eager to make history and have her name etched onto the trophy yet again. “The ToC is [one of] the most prestigious tournaments and I’m looking forward to playing again in this wonderful venue,” said World No.2 El Sherbini. “It’s amazing playing in Grand Central. You can see the people everywhere. We need more tournaments with unique venues like the ToC. I can’t wait for this year. El Sherbini will be making her first appearance on the PSA Tour since losing the World No.1 ranking to fellow Egyptian Raneem El Welily – ending a 31-month spell atop the World Rankings. The two-time World Champion will be unable to regain the top spot in New York, such is El Welily’s points lead at the summit of the rankings. However, with El Welily winning two out of four PSA tournaments so far this season, the younger Egyptian is determined to keep pace as she aims to reclaim the No.1 ranking. “Of course, it [losing the World No.1 ranking] motivates me to regroup and train hard for the second half of the season,” she said. El Sherbini has a bye into round two and will play either Egypt’s Hania El Hammamy or a pre-qualifier for a place in the third round. She is seeded to meet last year’s runner-up Nour El Tayeb in the semi-finals. El Welily, meanwhile, will play either Mariam Metwally or Ho Tze-Lok in the last 32 and is predicted to face New Zealand’s World No.4 Joelle King in the semis. The women’s event takes place between January 18-24, while a men’s tournament, featuring defending champion Simon Rösner, World No.1 Mohamed ElShorbagy and Colombia’s Miguel Rodriguez, among others, begins on January 16. This year’s Tournament of Champions is the second most lucrative tournament on the PSA Tour during the 2018-19 season and features a $360,000 prize purse, which is split equally between the men’s and women’s tournament.